This topic has 11 replies, 6 voices, and was last updated 4 years, 11 months ago by Baldrick. The following groups today at 100 yards. I was breaking in the Upper I bought from Baldrick. This is 20 rounds of 55 grain wolf Gold. I was shooting with a 5-7 mph cross wind from the left. This is 20 rounds of PMC 62gr green tip (the hole under the 5). The upper is a PSA 18″ 1/8 twist. I was shooting resting on sandbags, and shooting relatively rapidly. Not rapid fire, maybe 3 to 5 second between shots. It is a DPMS lower that I worked the trigger, and added JP springs to. The Scope is a Primary Arms 1-6x with a burris throw lever mount, and I just set it up today. 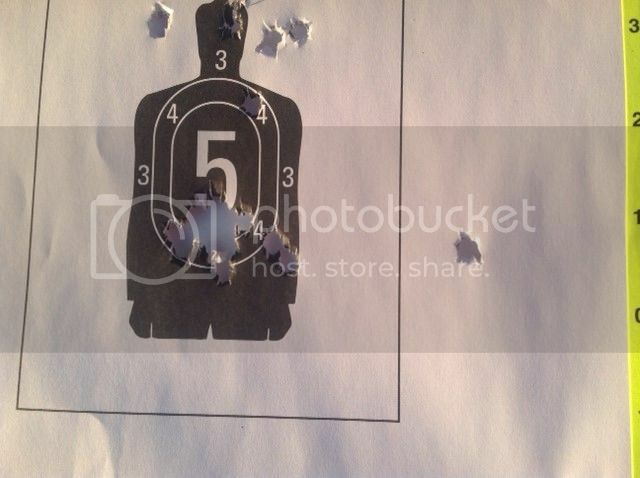 Took me about 20 rounds to get it dialed in. I am impressed. I used the money for my shiny new SCAR 16 which I shall be running for the patrol class this weekend! Always makes me happy when stuff I sell goes to a good home. How do you like that PA 1-6? I have always had excellent luck with PA optics, for the money they outshine other budget options IMO. I like the scope a LOT for the money. I have a couple of other scopes in that price range, and this one is head and shoulders above either of the others. What I was most impressed with is the quality of the glass, and the positive detent clicks on the turrets. I am sure that a high end might have a bit better glass, etc, but for the money, you can’t beat this scope. something else that surprised me was there was very little difference in elevation at a hundred yards between the different weight bullets. The 55 gr, if anything, was seemingly dropping more than the 62 or the 77. I was surprised when I shot a couple of the 77 gr just to see where they would fall. I figured they would be an inch lower or something. 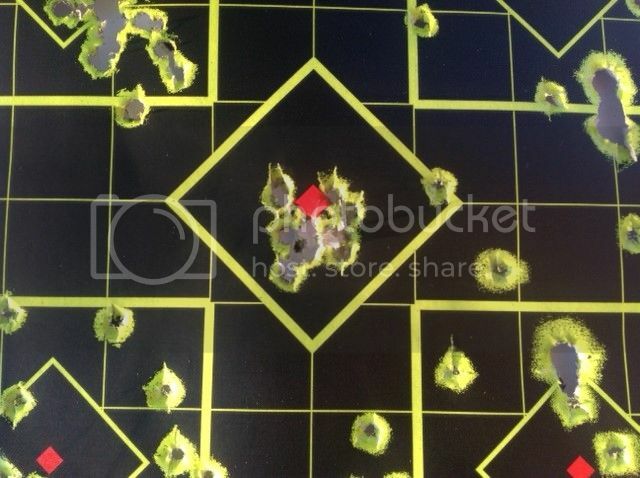 You can see the wind playing with the 55 gr bullets a bit more as the majority of those shots were drifting right, but the elevation was almost identical. In my experience the wolf gold is great stuff for the money. There are a variety of factors that could influence the pattern at 100 yards, and the differential between the 55 gr and the 77 gr. First: the powder loads. The 77 gr may actually be a hotter round because it has more powder relative to bullet weight. I know when I reload 77 gr rounds, You have the pack the powder in there. Part of this is due to the elongated bullet, which brings me to my next point. Second: Bullet shape and BC (ballistic coefficient). BC, if you didn’t know this already (not trying to insult anyone’s intelligence here) is basically the drag the air puts on the bullet. Some bullets will drop less than others due to a good BC. The 77gr IMI stuff may have a better BC than the wolf, and that could be it right there. I would google or ask the mfg if they have load data on the bullets, which would tell you how much powder and what the BC is. It could even be on the box, sometimes you get lucky! Third: Every gun is different. Every barrel is different. Some PSA uppers just like that one may love a certain round, and the very next barrel off the line may not. You just have to find what your barrel likes. Apparently yours is pretty versatile and not picky! Fourth: Ammo variability – If this is all factory ammo, and none of it I saw was match ammo, there will be greater variability between lots, and even between each shell. A machine dumping in the powder may or may not have exactly matched the previous shell it loaded. If you reload you have seen how groups will tighten up if you measure to the tenth of a grain when loading the powder. 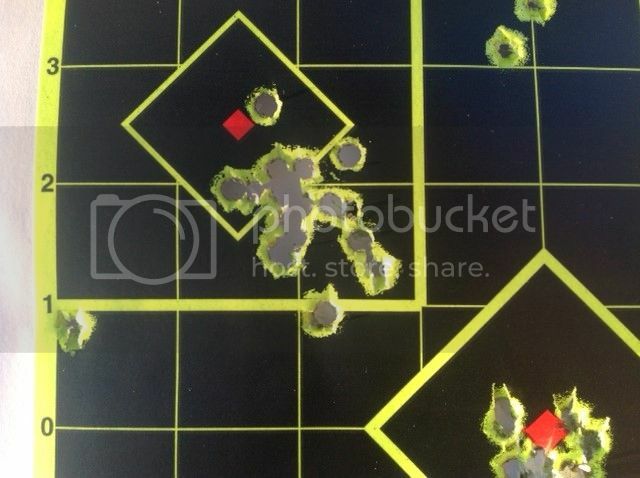 Consistency is everything, and it could just be that the lots of ammo you are shooting have variance in them. For 98% of use people never notice this. It’s not until you start getting scientific you realize the differences between match ammo and regular stuff. All that said, pretty darn good shooting!! From my limited understanding of ballistics, I figured it was probably bullet shape and ballistic coefficient, etc. The IMI stuff is a 77 gr. FMJBT bullet that is allegedly the Sierra Match King FMJBT. I need to get out somewhere where I can shoot two or three hundred yards and see how they fair at some longer distances. Thanks Baldrick for your synopsis on bullet 101 and rolling your own! It’s amazing how few 200+ yard ranges there are around my home. Up at the BOL we use a power line that runs through our property. Just a thought Eric if you have a issue finding a long gun range that is open to the public. Guess I’ll have to look into some of the Gold for training ammo. has it right now for 329.00 a case. Don’t be afraid of the wolf gold ammo. It was produced in Taiwan, it is reloadable brass, and the cartridges are sealed at the primer and the bullet just like all nato spec stuff. I have shot probably 3k rounds of it now without a single failure of any kind. What Eric said. MAC (Military Arms Channel on YouTube) did some good reviews with it, I have reloaded the brass and it is nice stuff, and I ran that almost exclusively at the CRCD in Feb and had no issues. My only issue in the whole class in fact gun wise was overinserting a POS mag I should have thrown away before the class anyways. So yeah it’s good stuff.